Your asphalt parking lot isn’t likely the most glamorous aspect of your business, but it does present an opportunity to make a great first impression and save you money. In fact, taking preventative steps to maintain your parking lot can save you a lot of money in repair costs and keep your parking lot looking great for years to come. At Wolf Paving, we often recommend these three simple tips to help our customers maintain their asphalt parking lot. You can never underestimate the power of a good cleaning! Taking time each month to clean your asphalt pavement is very important to maintain the lifespan and durability of your asphalt surface. Cleaning away surface debris, like leaves and garbage, will ensure that your asphalt does not get stained or damaged over time. Pay particular attention to fuel or oil stains and try to clean these spots immediately; fuel and oil can quickly deteriorate your asphalt pavement surface. There are simple DIY steps to clean your asphalt or try using a degreasing cleaning agent specifically designed for asphalt pavement. Being proactive and cleaning your asphalt surface can save you money over time. 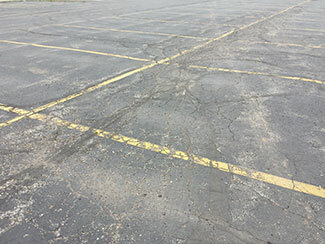 Removing tough stains, like fuel and oil, can prevent deterioration and extend the lifespan of your parking lot. Potholes are caused by the expansion and contraction of water after it has entered into the ground under pavement. The pothole repair process involves four important steps: clean, heat, add the new custom aggregate mix, and cool. Repairing a pothole before it spreads and causes further damage to your parking lot surface is very important. Potholes left unchecked can grow continuously with ongoing traffic and use, increasing the cost of repair and reducing the integrity of your entire asphalt surface. Sealcoating protects and prolongs the life expectancy of asphalt pavement by filling surface damage and providing a protective layer to keep out damaging UV rays, vehicle fluids and water. Sealcoating should be completed every 3-5 years to protect the asphalt surface and to give the surface a fresh look. Without a regular sealcoating application, you leave your asphalt surface unprotected from the elements and external factors. A properly maintained and sealed asphalt surface has an extended lifetime and reduces long-term repair costs. The lifespan and cost of your asphalt parking lot depend a great deal on two key factors: preventative maintenance and choosing the right asphalt paving contractor. If you follow these simple parking lot maintenance tips, we are confident that you can reduce your long-term parking lot costs. Take a look at your parking lot, what is it saying? With 75 years of asphalt paving experience, from highways to driveways, we are your local source for all of your asphalt paving needs. For more information on Wolf Paving or to request a free quote for your next paving project contact one of our two offices. If you live or work in the Milwaukee area, call us at 262-965-2121. For the Madison area, call us at 608-249-7931.